“A lush and gorgeously written debut, packed with action, intrigue, and a thrilling love triangle. Defy by Sara B. Larson is a quick fantasy read with tons of action, adventure, and romance. Even though Defy is a fantasy, there are no info dumps, which was a good thing? Well, I'm not entirely sure. Larson explains her world little by little through action instead of long winded exposition. It makes for a fast paced read, but a less evolved world. I'd call this light fantasy, if anything. But, it definitely worked for this story and I did enjoy the treks through the jungle and the longtime war between Blevon and Antion. I just wished I'd gotten a little more of that stuff, I guess. The love triangle is slightly different from anything I've ever read before because Alex already knows both of the boys and she's attracted to them, but they think she's a boy. I don't mind love triangles, necessarily, but I like to see them done right. I had high hopes for this one and, while I did like both love interests, I would have liked to see a little more communication between all three of them. I love it when it's not all about the girl and the boys develop a friendship as well, so instead of competing for her they respect that she has feelings for both of them. I expected something like this in Defy, since Rylan is one of Prince Damian's guards and the two know each other and work together, but, unfortunately, no such luck with these three. The boys talk maybe once in the entire novel and everything centers on Alex. Alex is a little... I'm not quite sure what she is. She's strong and a great fighter at times, but has moments of weakness. She's smart, but didn't realize that the two boys she was attracted to had feelings for her, even though they were very open about it. I guess she's a bit of a contradiction, but then again, what seventeen year old isn't? But, I have to admit, for all of her sword skills and acting like a boy, she's got a lot of damsel-in-distress qualities. I liked her, but I didn't love her. Especially her habit of getting down on herself all of the time. I mean, seriously. If you don't believe in yourself, no one else will either, no matter how good of a sword fighter you are. As far as the love interests go, Damian was quite innocent for being the snarky prince. He honestly just liked Alex and felt a connection to her because of their circumstances. He didn't know he was even in a love triangle. And Rylan was such a sweetheart. He was honest with Alex about his feelings and tried to stay out of things once he realized she liked Damian. Although, I do wish he'd had a bigger role throughout Defy. But, like Alex, for all their good qualities, I just didn't love either of these boys. But, I did like them and enjoyed reading their story. 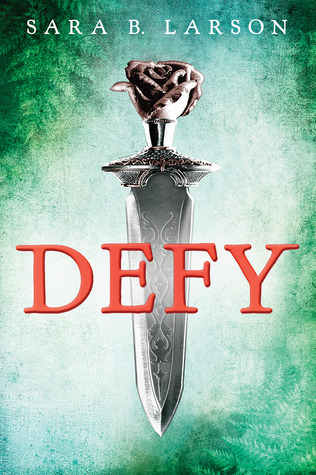 Defy feels a little like Throne of Glass. It's got sword play, a cruel king, a love triangle between a prince and one of his guards, and a tough heroine whose a natural born fighter. It's lighter than Throne of Glass though. Less gore and less intense romance make Defy a great start to a series for younger YA readers. For more about Defy check out these sites! The no info dumping is a plus to me, even if we know less about the world in return. The whole love triangle thing is really getting on my nerves though lately. I'm trying to avoid them for awhile! (If that's even possible?) I'll still read this eventually but not right away.